Wisdom usually involves intelligence beyond the merely personal. Nature and evolution have much to teach us, as do broadly shared spiritual, philosophical, and ethical understandings. So practice moving beyond isolated awareness, deepening into our common humanity and the rest of nature, and witnessing how our personal consciousness links to the universal. Wisdom usually involves intelligence beyond the merely personal. 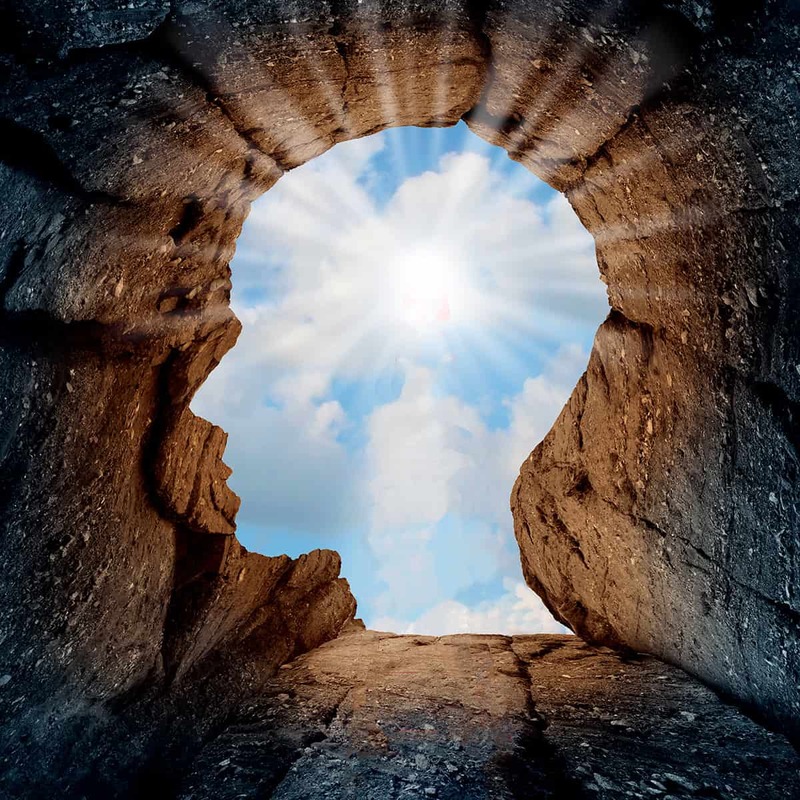 What I am calling universal intelligence embraces many different ways of moving beyond our personal perspective, intelligence, and information. Nature and evolution have deeply embedded in them massive intelligence, information, solutions and wisdom. This is true in any given part of nature, whether a natural system, particular organisms or particular kinds of organisms, relationships between organisms, or the planet as a whole. These are all dimensions of nature. Nature is always evolving and evolutionary solutions to the problems of life are embedded in the forms that nature takes and the processes that it goes through. So we can get beyond our personal and even species/human-centric ways of seeing things to the extent we open ourselves and investigate what nature has to tell us about what it has found as it has done its complex processes of trial and error and systemic and holistic creation. Everything is bound together and that binding – the connection and the kinds of diversity it embodies – is exactly what we (who so often think of ourselves as separate entities) need to learn from, absorb the wisdom of, and apply in our individual and collective lives. Such lessons of nature are similar to the common ground we find in spiritual, philosophical and ethical traditions. There are, of course, many differences and battles between different religions and philosophies. But there is also a lot of common ground. There are universal understandings that come from mystics of all different traditions. There are universal understandings that come from philosophers who have thought deeply about what’s going on in the world, or the nature of reality. The common threads among these thinkers offer some really powerful insight. There are also parallels between human ethics and evolutionary dynamics because both have to do with relationships. For example, The Golden Rule is a very fundamental principle that shows up in virtually every major spiritual or religious tradition. It’s pretty obvious that if you are doing things to other people that you wouldn’t want done to yourself and that they don’t like, the chances are good that it’s not going to turn out well. If you are doing things that other people like, value or enjoy, then things are probably going to turn out well, particularly if they are doing such things to you, too. This is so basic and obvious, but so often we still don’t do it. My father used to talk about having “a golden rule foreign policy” to treat other countries the way we would like them to treat us. Once we in the U.S. (and elsewhere) talk about foreign policy from the viewpoint of the Golden Rule, we see just how far we have wandered from these basic understandings. 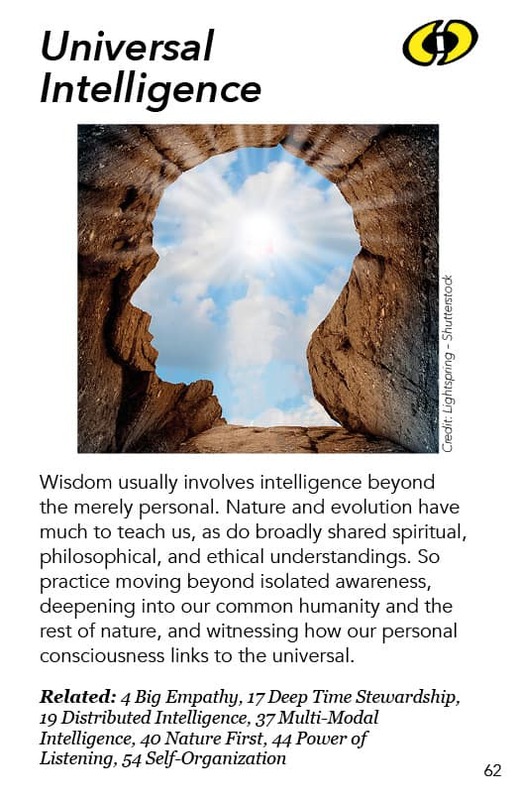 So going back to such wise guidance that evolved among us human beings – whether they are spiritual, philosophical or ethical – is a feature of tapping into universal intelligence. There’s a lot that can be said about things that survive and that show up all over the place – whether ideas, innovations, or organisms. The ideas that survive and show up all over place tend to survive because they have some value to them, just as traits in organisms survive because they have some value to them. The more of those we can understand deeply, the more wisdom we can extract from them when we are consulting them in our decisions. Wisdom comes to us from transcending our limited awareness. This can be as basic as me talking to you and listening to you, and you talking to me and listening to me. Right away in that basic conversational dynamic – if we both take it seriously and do it well – we are transcending our limited awareness and getting into systems thinking to see the larger picture. There are other ways we can learn to transcend the limits of our individual, cultural, and species awareness, deepening our sense of our common humanity and even our common life. Tribal societies have long known – and science is now realizing – that animals and even plants have levels of intelligence and feeling and responsiveness that we in our hyper-materialist sensibilities may not have properly granted them. But if we really look, we find out. More and more science is clarifying things that many more traditional societies have already assumed and experienced in their many interactions with the world. Another realm of universal intelligence involves “seeing God in every person” or really getting that we all come from a common ancestor, or feeling compassion when something difficult happens to somebody we always thought of as “the Other” or just getting to know them. Very often people have prejudices because they don’t know anybody “like that”. They don’t know a gay person, they don’t know a black person, they don’t know a rich person, they don’t know who this “other” is, and so they put all such people in a box surrounded by assumptions and treat them as an “it” or a threat, rather than as a legitimate being who is, in most ways, quite like themselves. So various ways of deepening into our common humanity is another way of universalizing our intelligence. Some meditative traditions can train us in mindfulness or witnessing how our personal consciousness links to the universal. The more we observe the dynamics of our own consciousness, and the way those dynamics make us feel separate, the more we see that there’s something underlying that feeling of separateness which actually ties us, or makes us realize we are an expression of something that is deeper, larger and broader than our individual personhood. The idea of an “individual person” is to a certain extent a construct. Just as “race” is a construct of the society, separate personhood, too, is a construct of the society and of biological and psychological developmental dynamics such as “ego development”. That can be transcended by meditative processes that help us witness – right now! – our own mental dynamics making us think we are separate from everything “out there”. All the above are ways to expand our intelligence beyond the merely personal into increasingly universal ways of experiencing engagement. The Golden Rule I discussed in my main essay on this pattern. Deep Ecology is an integration of ecological understandings and pagan (nature) spirituality. It involves our sense of immersive consciousness in nature that can coexist with scientific understandings of what’s going on in nature. Two manifestations of this are shamanism – deep indigenous spiritual practice – and biomimicry. Some shamans (and their modern analogs, like the leaders of Findhorn) consult directly with animal and plant spirits, with often remarkable results like discerning the healing powers of plants. Biomimicry, in parallel and contrast, is the scientific search in nature for solutions to human engineering problems. The Quaker process of silent worship involves a sense of waiting for some larger intelligence to show up and offer guidance, which they call “waiting on the Light”. If we are open to It, It will offer us insights. Quakers believe that we can access this larger source of insight, especially when we do it collectively. Together we can be like the mythic “blind men and the elephant” as we wait for our different guidances. Sitting together in silence, we may get and share different guidances but if we hear each other deeply, we can realize that we are hearing different aspects of this larger Guidance. Quakers speak of their business meetings as “meeting for worship for business”. So it’s not just a business meeting, and it is not just a Quaker worship meeting. It is a meeting for worship for business where they use this process – their spiritual version of consensus process – to make collective decisions. And the Collective Wisdom Initiative studies that kind of thing. When a bunch of people sit meditating together, how do they access the larger intelligence within and beyond themselves and tune into it. They may discover that each one of them is tuning into that source of wisdom in a different way. There’s then a need to integrate those diverse perspectives. Once you listen to your different tunings on the different stations on the radio, how do you put them all together? I have often thought that there are two different (but overlapping) dynamics that can be happening in group process when it is really good. One of these dynamics involves tuning into intelligences that are beyond the individual selves of the participants. The other involves generating synergy among diverse people and perspectives in the group. In the first approach you want to make sure you have people who are really good at tuning into mystical realities or collective consciousness. In the second approach you want to make sure you have diverse people and know how to synergize such diversity. These can lead to very different approaches to group process. I have experienced the impact of both of those approaches and I would love to try to sense what role each of them is playing in a particular group. The Happiness Hypothesis is a book, an evolutionary study of human ethics systems. It explores ethical guidance for behaviors that are universal because they help people survive individually in social contexts or as communities and societies in larger contexts. So it is an evolutionary study of ethics – which is a very interesting approach. The Earth Charter is a document created by a very large network of people which considers – since we are all here on the earth together – how we should behave to make sure that we are living in ways that help us sustain our society and our personal lives.